Happy Spring Break everyone, or happy coming back from spring break everyone. Whatever the case may be, I hope everyone is excited about the new Criterion releases coming in June. And if you look at this list and cannot decide on what to get, it's okay. You can just buy everything because my cohort has a birthday in June. SYNOPSIS: This diabolical thriller was the first film from director Danny Boyle, producer Andrew Macdonald, and screenwriter John Hodge (the smashing team behind Trainspotting). In Shallow Grave, three self-involved Edinburgh roommates—played by Kerry Fox, Christopher Eccleston, and Ewan McGregor, in his first starring role—take in a brooding boarder. When he dies of an overdose, leaving a suitcase full of money, the trio embark on a series of very bad decisions, with extraordinarily grim consequences for all. Macabre but with a streak of offbeat humor, this stylistically influential tale of guilt and derangement is a full-throttle bit of Hitchcockian nastiness. SYNOPSIS: Charlie Chaplin’s first feature-length comedy for United Artists—which charts a lone prospector’s search for fortune in the Klondike and his discovery of romance (with the beautiful Georgia Hale)—forever cemented the iconic status of Chaplin and his Little Tramp character. Shot partly on location in the Sierra Nevadas and featuring such timeless gags as Chaplin’s dance of the dinner rolls and meal of boiled shoe leather, The Gold Rush is an indelible work of heartwarming hilarity. This special edition features both Chaplin’s definitive 1942 version, for which the director added new music and narration, and a new restoration of the original silent 1925 film. **Javi was able to check out this fim a couple months ago. Check out his review here. SYNOPSIS: After the death in 2004 of American theater actor and monologist Spalding Gray, director Steven Soderbergh pieced together a narrative of Gray’s life to create the documentary And Everything Is Going Fine. Brilliantly and sensitively assembled entirely from footage of Gray, taken from interviews and one-man shows from throughout his career, it is a rich, full portrait—an autobiography of sorts—of a figure who was never less than candid but retained an air of mystery. In essence, this hilarious, moving, and revealing film has become Gray’s final monologue. SYNOPSIS: One of the great raconteurs of stage and screen, Spalding Gray, came together with one of cinema’s boldest image-makers, Oscar-winning director Steven Soderbergh, for Gray’s Anatomy, a spellbinding adaptation of Gray’s 1993 monologue of the same name (cowritten with Renée Shafransky). In it, Gray, with typical sardonic relish, chronicles his arduous journey through the diagnosis and treatment of a rare and alarming ocular condition. For the monologist, this experience occasioned a meditation on illness and mortality, medicine and metaphysics; for the filmmaker, it was a chance to experiment with ways of bringing his subject’s words to brilliant, eye-opening life. SYNOPSIS: The Samurai Trilogy, directed by Hiroshi Inagaki and starring the inimitable Toshiro Mifune, was one of Japan’s most successful exports of the 1950s, a rousing, emotionally gripping tale of combat and self-discovery. Based on a novel that’s often called Japan’s Gone with the Wind, this sweeping saga fictionalizes the life of the legendary seventeenth-century swordsman (and writer and artist) Musashi Miyamoto, following him on his path from unruly youth to enlightened warrior. 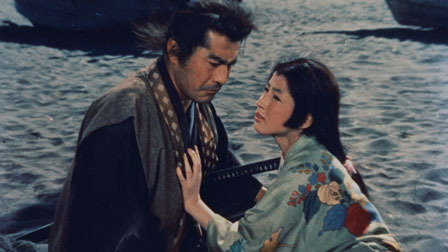 With these three films—1954’s Oscar-winning Musashi Miyamoto, 1955’s Duel at Ichijoji Temple, and 1956’s Duel at Ganryu Island—Inagaki created a passionate epic that’s equal parts tender love story and bloody action. SYNOPSIS: The 39 Steps is a heart-racing spy story by Alfred Hitchcock, following Richard Hannay (Oscar winner Robert Donat), who stumbles into a conspiracy that thrusts him into a hectic chase across the Scottish moors—a chase in which he is both the pursuer and the pursued—as well as into an expected romance with the cool Pamela (Madeline Carroll). Adapted from a novel by John Buchan, this classic wrong-man thriller from the Master of Suspense anticipates the director’s most famous works (especially North by Northwest), and remains one of his cleverest and most entertaining films.